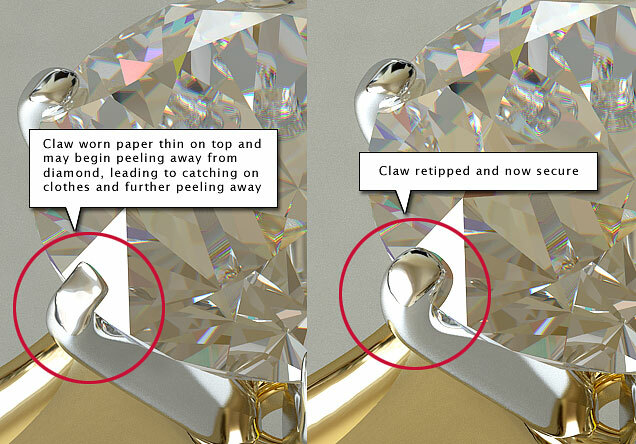 Everyday activity can cause the setting of your diamond to loosen. 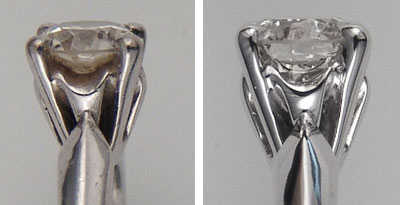 At NZ Jewellers we suggest removing your ring every evening and visually inspecting it for any bent or loosened prongs. It is important to visit a professional jeweller every six months to a year to have your mounting checked and tightened. During this time at NZ Jewellers we will clean and polish your setting to look brand new. To maintain the brilliance of your diamond at home, a dipping solution can be made by using one part ammonia (Handy Andy) and six parts water. Just swirling your ring in the warm water should clean the diamond but if you have stubborn dirt you can try gently rubbing your diamond with a soft tooth brush to loosen the dirt. Be careful to avoid brushing the gold itself, as this may cause it to scratch. You can always pop in-store and we will do this for you and check your dimaond ring setting security at the same time. Though diamonds are the hardest substance known to man and extremely scratch resistant, another diamond can scratch it. It is important to store your jewelry separate from one another, most preferably in a fabric-lined case or box with dividers. If your engagement ring is crafted from white gold you may find over time the ring yellows and does not look at all like it did when you took it home from the store. Don't worry, this is completely normal! White gold is made from a few different alloys including yellow gold. To give white gold the lovely white bright finish white gold rings are plated with a precious metal called Rhodium. 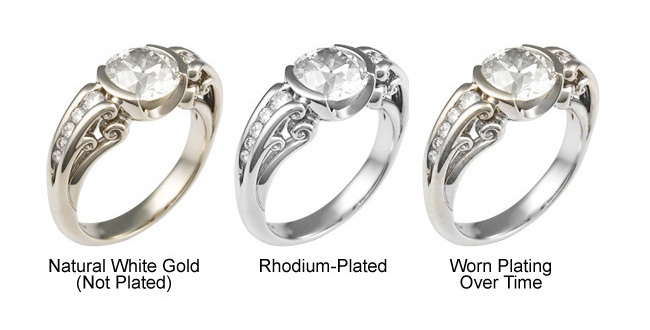 Over time this rhodium plating will wear, how quickly will depend on how hard you are on your ring. If you apply hand creams with your ring still on, or spray perfume/deodorant near your ring or work with any kind of chemicals, then the rhodium plating will wear much more quickly. In store we rhodium some clients rings every six months and others only every three or so years. Re-rhodium plating your ring requires the jeweller to polish the ring and then to re-plate the ring with the precious metal. A process that takes about a half hour and costs around $60. Pop in-store and see how quickly we can have your white gold rings looking like brand new again! Over time gold and platinum wears. We recommend popping in-store and having an annual health check up for your rings to ensure you do not loose your precious diamonds or gemstones. Once again how long your ring can go between needing maintenance will depend on how careful you are with your rings but even a single knock to your ring can damage the setting and loosen your diamond or gemstone so they can fall out, usually without you even noticing until it is too late to find them. Our jeweller can repair your setting to ensure the security of your diamond or gemstones.